Depending on your age or years spent in Chicago, your memories of the venerable Chicago Theatre may vary widely from those of others. 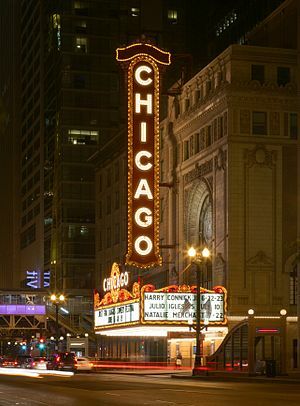 Built in 1921 by the famous theatre chain of Balaban and Katz, it was probably the best-known of the great Chicago cinemas in the Golden Age of the movies. Seating 3,880 people, the Chicago was a dominant movie theatre from its beginnings through the 1940’s. In the early 1950’s the movie industry began to feel the effects of the new popularity of television, which severely cut into ticket revenues. Theatre owners were forced into a great variety of promotional efforts to shore up ticket sales. Among these was to air-condition their theatres. How many of us remember the banners under their marquees announcing, “Cooled by Refrigeration”? The Chicago Theatre was no exception to this trend. Planners envisioned that the A/C equipment could be located in the basement directly below the vestibule where crowds of patrons waited to enter the auditorium. This vestibule was lined with large ambient-air wall vents, about 4 by 6 feet with lattice-like grills through which the air could pass. Figuring that the air conditioning could be hooked up to the vents, the technicians checked out the basement. There they discovered hundreds of old wallets covered in dust. A look at the contents showed that most were decades old. How did the wallets get there? And why were they there? Include your entries, guesses, or expert answers as a “Comment” below. All are welcome! None will be disqualified! I’ll reveal the correct answer in a couple of weeks. This entry was posted on Tuesday, July 3rd, 2012 at 6:20 pm	and tagged with Arts, Chicago, Chicago Theater, Chicago Theatre, Larry, theater, Theatre, United States and posted in Around Town. You can follow any responses to this entry through the RSS 2.0 feed. Thanks for your interesting answer(s). Very good thinking. They were from patrons of the theater who had them fall through the seat and the ushers or managers never let the owners know.?? Maybe there was no phone number included in the info (because not everyone or most people did not have phones) and the theater wasn’t about to mail out letters letting people know they had their wallets?? I’m sure however the wallets they found had no cash in them. Very imaginative analysis! I will publish the solution less than a week!